I was introduced to Karen Olsen Ramsey through my friend, Beth Rosengard. I had asked Beth for recommendations on people she thought to be great jewelry designers/creators and she gave me a tremendous list of people….many of whom you will see in the blog over these next months. Karen’s work is amazingly crafted and ever so lovely! She specializes in chasing and repousse which seems to be rarer to find these days so I started our interview by asking about her focus on this technique. I like the fact that chasing and repousse are ancient metal forming techniques. I am very interested in lifestyles, items, and many of the time-honored values of prior generations. I feel the importance of slowing down, taking time, noticing and connecting with what we are doing on a daily basis. Working with my hand tools in my studio as I tap shape into my metal, I feel a sense of relaxation and peace. My pace is not hurried, nor am I concerned about a mass production run. To me, the process evokes a connection to traditional craftspeople, a respect for process that symbolizes quality, intention, and a reverence for life that supercedes the hurriedness of our modern daily lives. I really enjoy working directly with the metal. I have carved and cast wax models in the past, and have enjoyed doing that, but I feel a real affinity with the metal itself. I love to see how plastic it can become, and I also enjoy the challenge. I have a strong background in woodcarving, which is a subtractive sculptural process. Forming metal sculpturally through chasing, repousse, and forging is a similar process, in that material is not added to create the sculptural form. Material is shaped, changed, or removed to create the dimensional form desired. Process has to be carefully planned and analyzed in advance, as mistakes are difficult (if not impossible) to repair. To me, this is the ultimate challenge. Envisioning and designing a piece of jewelry comes naturally to me. Taking my two dimensional drawings and executing them into three dimensional finished pieces takes careful planning, consideration, and patience. Sometimes I make prototypes of certain elements to work out the complicated fabrication processes before taking on the finished pieces in gold. Successfully completing a challenging fabrication is what brings me joy…knowing that I have the tools and experience to bring to fruition a design that originated in my head, and knowing that I persevered until it was complete. I know a fine furniture maker who finishes the backs and bottoms of the drawers in his pieces as if they were the front sides in view. I really liked that concept when first I heard it, and have incorporated that practice into my jewelry as well. I want the backs and insides of my pieces to be respected as integral elements of the piece, and not just considered “the utility room”. Some pieces are designed with an element from the front side that carries over to the back. Others symbolically contrast the feel of the front. Sometimes a stone or pearl is set there as well. I don’t typically publish photos of the backsides of my pieces, nor do I show clients a drawing of the backside on commissioned work. It is a surprise element that is then looked forward to with anticipation while the piece is being made. Some clients flip the piece to the back as soon as they receive it to see what is there before spending time looking at the front. I feel that the backs of pieces are personal… it is the part of the piece that is only visible to the wearer, and they alone hold the prerogative to reveal or keep concealed that aspect of their jewelry. The backsides also remain an element of surprise. If a piece were to accidentally flip to the back side, the viewer’s response would be one of pleasure, rather than dismay. It is unusual for someone to make all ear wires, chains etc. Why have you chosen this route? My pieces are all very individual. Many are one of a kind, and others are made individually in limited editions of 12. Because of this, they have a look of being made, one by one. That look and feel is important to me. I want my clients and those who view my jewelry to really sense the passion that I have for making jewelry, and the reverence that I infuse in each part of every piece that I make. Commercially made chains and components have a look of consistency that contrasts with the unique individual look that my pieces imbue. I want my work to be an extension of me, of my values, and of my heart. Incorporating ready made components would bring in machine made and mass production elements that I want to limit, both in my work and in my life. You say you built the "ultimate jewelry studio". What makes it so? Oh, my studio is my little slice of heaven! Built into the hillside a short walk down a woodland garden path from my house, the studio is bright and inviting. A wall of recycled casement windows and French doors face west onto a wooded slope. My fabrication bench looks out these windows, and gives me views into the natural world that is my inspiration and my muse. I am a do-it-yourselfer, and designed the studio myself to allow for all of the workstations and tools that I wanted to bring into the space. Someone once told me to allow for at least twice as many electrical outlets as a typical room would have, so that I did! I have 23 outlets, and actually could use more! I had a contractor build the foundation, walls and roof, and I completed the electrical, plumbing, insulation, drywall, floor, and trim myself. It is really “my” space, and when I sit down at my bench in the morning, I feel like I have come home. I continue to add specialty tools to my studio as time goes on, but for the most part, I feel very fortunate to be able to work in a beautiful space, walking distance from home, and have all the tools that I need right at my fingertips. I don’t really have a term that describes my work accurately, and I guess that I prefer not to categorize it with a label. 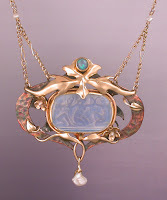 My influences are from the great French jewelers of the Belle Epoch, Japonisme art, and the natural world around me. 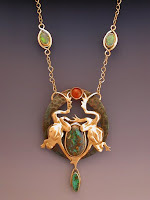 When I design a piece of jewelry, I strive for a design that takes the eye on a visual dance. I want the elements of each piece to move lyrically from one part to the next, to create a story within the imagery, and evoke a sense of movement, spirit, and peace. 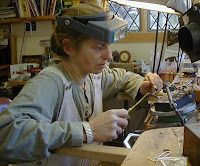 So many great jewelers come out of the Revere Academy. What do you think was the most important thing you got from that experience? Revere Academy has an amazing plethora of highly skilled, knowledgeable, compassionate, and fun teachers! I can say without hesitation that the most important thing that I received from my training at Revere’s was a profound respect for precision and exactitude in fabrication skills. I also learned the patience needed in order to achieve that precision. I believe that our greatest challenge is to see challenge as opportunity. I have a phrase that I like to use that I call “Going in the Back Door”. I taught this to my daughters when they were young, and they use it successfully still. When faced with a difficult issue, I reminded them that the difficulty only faced them, and that, if they were to go around to the back side of the problem, they’d surely be able to get through it. Within every challenge lies an opening for something new. Without that particular challenge, we might never have the opportunity to pursue the new path that presents itself to us in this moment. So when a difficulty arises, I encourage myself and my family to look for the opportunities that are possible only because of this issue…what alternate directions can I look in that I might not have otherwise. I am always pleased, and many times thrilled with the new directions that become apparent in such moments. It takes the frustration, pain, and stress away from difficult times, and transforms them into growthful and productive opportunities. With the slow down in the economy, I am taking time to reassess my priorities. I am reevaluating how I can use my time more efficiently, more meaningfully, and more generously. I am hopeful that everyone will look at their own lives and businesses and see how they might be willing to change in order to meet the challenges in front of us right now. The biggest opportunity of 2009, I believe, is the encouragement from President Obama to volunteer. Getting involved in community service is an amazingly rewarding opportunity to feel needed, to spend time doing something important, and to make a difference in the lives of people whose lives are dramatically altered by this present economy. Giving of oneself is a powerful antidote to stresses and worries, and offers opportunity to view momentary concerns from alternate perspectives. “The greatest distance in the existence of man is not from here to there nor from there to here. Nay, the greatest distance in the existence of man is from his mind to his heart. Unless he conquers this distance he can never learn to soar like an eagle, and realize the immensity within." What a pleasure to get to know Karen. Her work is masterful and I love her outlook on life (not to mention her fabulous studio)! She echoes the sentiments of almost every designer I meet—using this economic crisis to reassess priorities and work on perfecting the work. I wish Karen continued tremendous success and happiness. Karen's work is wonderful! So detailed. Love the vine piece. Looks like she has a great studio. Beautiful jewelry! Enjoyed your post. 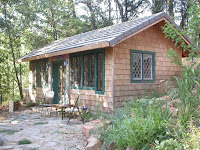 Karen has a great studio to work in - nice peaceful surroundings. Lisa Krikawa: Wonderful Wedding Rings and more! Tom Herman: Carving Classic Romance!